Ubuntu by default, really doesn't provide a visual feedback on connection of a USB device, whether it was detected properly or not. 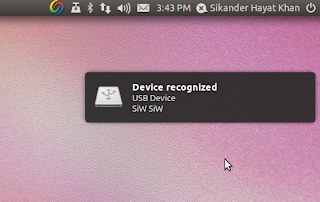 'udev-notify' is a small package which does the job for you under Ubuntu. You can download the .deb of 'udev-notify' from the link below. It is supported on Ubuntu 9.04 and later. Double click the downloaded .deb and install it. You'll need to logout and back in for udev-notify to take control.